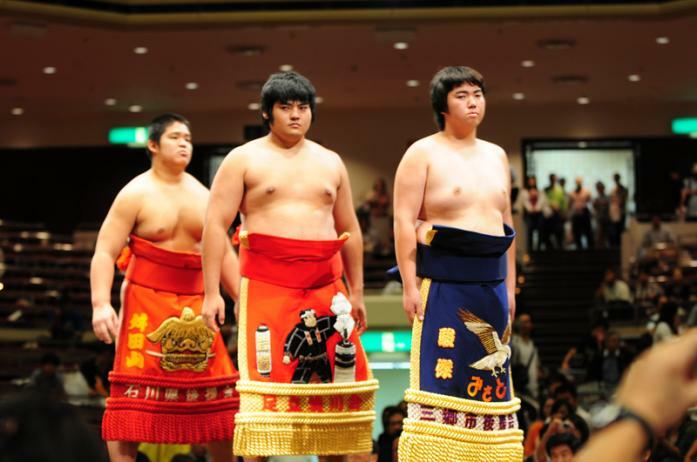 There was quite a small number of shin-deshi promoted for the Kyushu basho 2008 - only three newcomers: Kawashita, Kunigami and Kameiyama. Two of them are sixteen years old, the third is twenty. The oldest of the three, Kunigami, already weighs 138 kilos, which is relatively heavy for a new entrant. However, none of the three shin-deshi is exceptionally light as was the case with Asayamashita four months ago. As for Asayamashita, he was absent from the tournament and it is unlikely that we will see him again, unless it is in the role of a gyoji, which would be more suited to his very slender build. Kunigami had a disappointing maezumo tournament considering his size and age, especially in comparison with the other two, and won only one bout. Still, he joins a significant number of very talented deshi swarming in Sakaigawa beya, and he will certainly profit from that very favourable environment. Kawashita, at sixteen years old, joins Chiganoura beya, the home of the Hungarian, Masutoo. He completed an exemplary maezumo tournament for someone his age, winning all three of his bouts. The very young deshi is already of an imposing size, all the more because his weight and height can still increase. This was the first time since the 2001 initiation of additional tests for rikishi who don't fulfil the minimal standards, that not one deshi had to submit to them. The last of this little batch, Kameiyama, who joins Hanaregoma beya belonging to former ozeki Kaiketsu, is the smallest, lightest and youngest of the three. As such, he had a difficult maezumo tournament with three losses against his opponents. He will have to get himself together, but his youth allows us to hope for improvement. It is surprising to realise that these three deshi could fight their three maezumo bouts without facing each other more than once. That was possible because they were joined by Azumanami, a deshi from Tomozuna beya, who, after three basho with a meagre record of eleven victories and eleven defeats, disappeared for two basho in May and July. Completing his return maezumo tournament during the Aki basho, he re-entered the ranks of professional sumo for the November tournament. Table listing rank, shikona, real name, date of birth, height, weight and heya of all new recruits.